UPDATED: Does California Need a Catastrophic Fire Fund? Gov. Jerry Brown on Friday signed a legislative plan to help California utilities deal with the massive costs of wildfires sparked by power lines. But that measure’s proposal to let utilities sell bonds to pay for fires may not be an adequate solution to the bigger and more destructive blazes that appear to be the state’s new normal, some skeptics contend. Going forward, California may need to establish a catastrophic wildfire fund or similar program to keep utilities solvent while quickly compensating wildfire victims, they said. 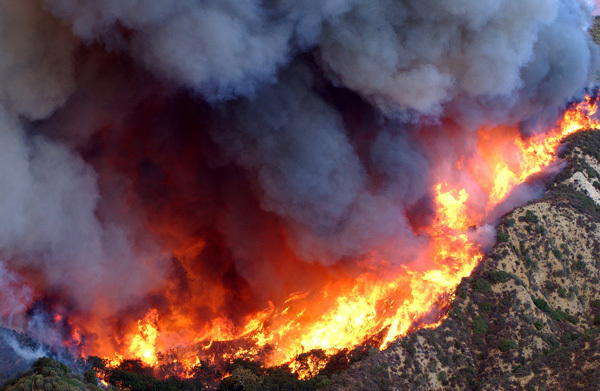 One proposal that failed to make it into the bill was a plan to establish state-regulated investment accounts that utilities could use to cover future wildfire costs, said Barry Moline, executive director of the California Municipal Utilities Association. “We proposed not so much an insurance fund as a savings account,” Moline said. “The idea was to create this fund that utilities would pay into a little at a time,” with tax breaks as incentives, he said. The plan proved too complicated to deal with in a limited time frame, but it could come up again next year, he said. Another proposal was to create a program similar to the one Florida established for hurricane relief. “We should be thinking about solutions like the Florida Hurricane Catastrophe Fund, which uses a modest surcharge on insurance policies to cover catastrophic losses,” Tom Long, litigation director for The Utility Reform Network, told lawmakers at an Aug. 9 hearing on SB 901. That idea gained little traction because it essentially would have required those with sufficient homeowners insurance to subsidize those who are uninsured or under-insured, Moline said. Lawmakers passed SB 901 shortly before concluding their two-year session at the end of August. It included some elements of a proposal Brown sent to the State Legislature in July. Most of the proposals discussed prior to the bill’s passage had two goals: to compensate fire victims and to reduce the costs of holding utilities strictly liable for fire damages. California extensively uses a legal procedure called “inverse condemnation” to make utilities pay for wildfires caused by electrical equipment, whether or not the utilities were negligent. Because the utilities can use eminent domain to take private property, the thinking goes, they should be liable for all damages to private property. The result is that utilities often pay damages to fire victims without a long court battle over fault. Inverse condemnation exists in almost every state, but California has used it far more broadly than any other jurisdiction. That worked fine for decades, but recent fires have been cataclysmic, perhaps because of climate change. A series of blazes in Northern California’s wine country in October 2017, for example, could cost Pacific Gas and Electric more than $15 billion, according to some estimates. As a result, PG&E’s stock has struggled in recent months and its financial solvency has been called into question. “The possibility of that liability [for the 2017 fires] destabilized the utilities, lowering their bond ratings, which increased the cost of financing, which is ultimately borne by ratepayers since it increases the costs of the utilities,” said Kellie Smith, chief consultant to the conference committee that drafted SB 901. Brown’s July proposal would have done away with inverse condemnation and strict liability. Utilities only would have had to pay for fires they’d caused through negligence. The governor’s proposal was widely criticized by insurers, plaintiffs’ attorneys and ratepayer advocates, some of whom called it a bailout of PG&E. A bipartisan panel of State Senators and Assembly members did not deal with inverse condemnation in the final version of SB 901. Instead, they drafted a plan that would allow the utilities to sell bonds to cover wildfire costs. The bond debts would slowly be repaid by additional charges on customers’ electric bills. That didn’t make the utilities particularly happy, nor did it appease ratepayer advocates. PG&E responded to a request for comment for this story by reiterating its general support for the bill but leaving open the possibility of future legislative action. “While the legislation addresses many urgent needs, we must continue to work together to ensure ongoing investment in climate resiliency and clean energy, and to combat the devastating threat that extreme weather and climate change pose to our state’s shared energy future,” the company said in a written statement. IEPA’s Smutny-Jones said it’s always been assumed that utilities could recover wildfire costs from ratepayers through incremental increases in electric bills. The magnitude of recent wildfires, however, calls that assumption into question, he said. “That’s the big uncertainty,” he said. If the state’s investor-owned utilities are destabilized, it could threaten California’s ambitious goals of largely relying on renewable energy sources, such as the wind- and solar-power generators that he represents, Smutny-Jones said. It’s likely that how the state pays for wildfires will be an ongoing topic in Sacramento, he said.